The primary images represented in a traditional Mexican Nativity scene are what you would expect to find in any other Christian country. Mary and Joseph, along with the three wise men, angels, shepherds and a variety of animals are grouped around a stable or manger. However, there are some notable differences. The nativity scene is traditionally set up in homes on December 14, but the infant Jesus is not seen until Christmas Day since Christmas Eve is the traditional birthday of Christ. Another striking difference is the size of the baby Jesus image, not at all on the same scale as the other characters represented, often as much as twice the size. This may have something to do with the relative importance of the Christ child as compared to the other players, ut serves a second purpose as well. Forty days from its “birth”, the infant Jesus image is taken from the manager, dressed, and presented to the congregation on el Día de la Candalaria. Having a larger, standard-size image enables the family to be able to buy a new outfit from local vendors for the presentation and be assured that it will fit. Another variant from the basic Nativity scene that is often found is the size and scope of characters represented. Not content with those who gathered in Bethlehem to witness the birth of the Savior, many households expand the Nativity scene to include animal and character representatives from all parts of the world. Therefore, not only would there be some donkeys and cows present, but further from the central image of the baby Jesus in a manger, there might be elephants and kangaroos positioned as to seem to be making their way to pay homage. I have seen entire rooms dedicated to el Nacimiento (Nativity scene). 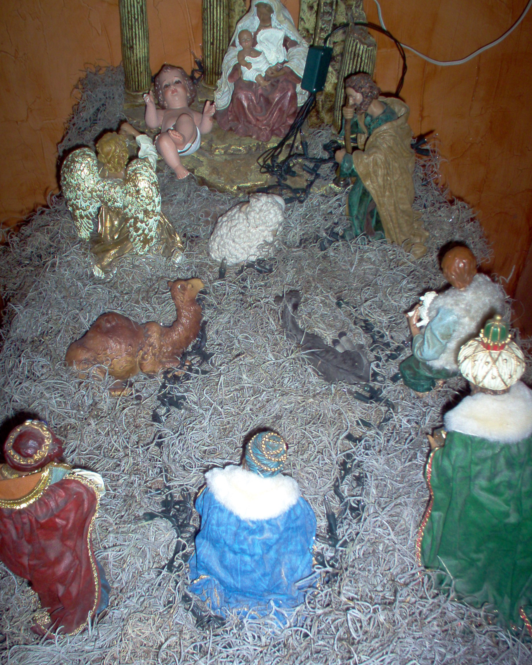 El nacimiento (Nativity scene) plays a part in Las Posadas as well. When it is time to rezar (recite the rosary) Posada attendees are often grouped around the Nativity Scene, making them part of the extensive group of worshipers that have come to pay homage to the newborn King.